One Record, Two Hits And A Rock 'n' Roll Revolution Hear the stories behind 1956's "Hound Dog" and "Don't Be Cruel," Elvis Presley's two biggest hits. Elvis Presley, in an undated photo. Tuesday marks the 34th anniversary of Elvis Presley's death. Hear the full story — and the music — behind two of his most enduring hits in the first installment of The NPR 100. Released in 1956 as two sides of the same 45 RPM record, Elvis Presley's "Hound Dog" and "Don't Be Cruel" rose quickly to the top of the charts, signaling a revolution in popular music. To this day, they remain the biggest hits of Presley's career. Jerry Leiber and Mike Stoller, the writers of "Hound Dog," were white Jewish teenagers who began their careers crafting songs mostly for black artists. Leiber says they originally wrote the song for blues singer Big Mama Thornton to take advantage of the "guttural, growling" sound of her singing voice. Presley's hit version took the song in a new direction: It allowed him to move. 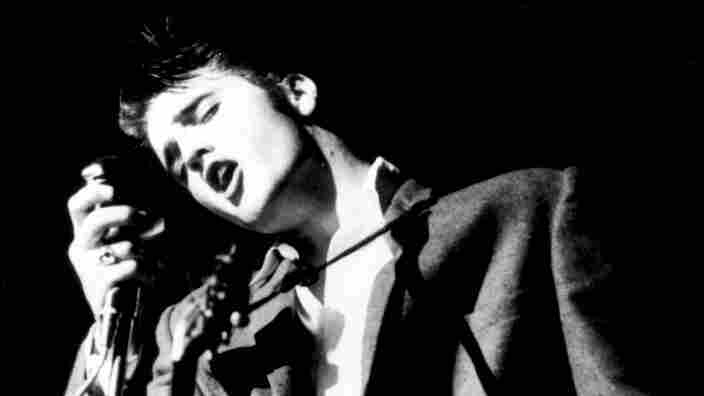 As Presley said in a 1956 recording sent to fan magazines, the more he moved, the more his audience went wild. "It's like we're all getting something out of our system and none of us knows what it is," Presley said. "Don't Be Cruel" songwriter Otis Blackwell was a black teenager from Brooklyn who drew his inspiration from romance comics and the "Singing Cowboy," Tex Ritter. When he heard that Presley had chosen one of his songs to record, he recalls, "The first thing I said was, 'Who the hell is Elvis Presley?' "
Blackwell found out soon enough. A month after the record was released, on July 13, 1956, "Don't Be Cruel" went to No. 1. In the recording session that brought about Presley's "Hound Dog" and "Don't Be Cruel," biographer Peter Guralnick says, the singer and his band were fashioning a new kind of music, transforming rhythm and blues into something more straightforward and beat-driven. Presley had a complex, and sometimes controversial, relationship to the mostly black artists whose music influenced him. But according to Presley, his motive was simple: "When I sing, I just sing from my heart," Presley said.